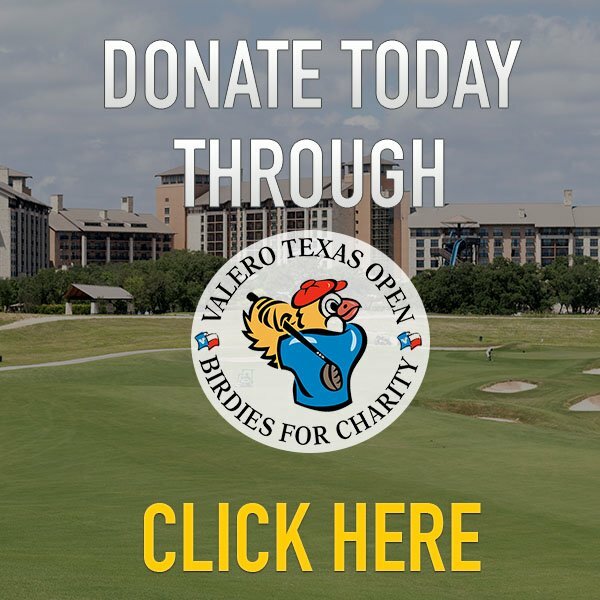 Since 1997, the Valero Texas Open has helped hundreds of local non-profit charities and schools raise money through Birdies for Charity. This is a no-cost program that gives 100% of the funds raised back to participating organizations. Donors make a pledge for every birdie made during the Valero Texas Open tournament week. Last year there were 2,103 birdies made, so a $0.01 pledge yielded a donation of $21.03. This unique and engaging platform also provides the option to make a one-time contribution in lieu of a pledge. Historically, 98% of funds raised were on-time contributions. Recommended pledges are $.01-$.04/birdie for individuals and $.50-$1.00/birdie for corporations. Recommended one-time contributions are $20 for individuals and $1,000 for corporations. All contributions and pledges can be paid in advance or be billed after the tournament. Remember: all financial contributions are 100% tax deductible. Make your online donation and give your best guess of the number of birdies by clicking here. Don’t forget to choose “Military Warriors Support Foundation” when giving your donation so we receive 100% of your contribution! If you have any questions, don’t hesitate to contact our office at 210.615.8973. Army Veteran Awarded Mortgage-Free Home! We joined forces with George Strait to Honor our nation’s heroes! Mortgage-Free Home Presented at Lee Brice concert!